In a nutshell: The Samsung UE50NU7400 is a bargain hunter's dream. You'll be hard-pressed to find another TV that gives so much for so little. We love the 50-inch screen, UHD HDR support, access to streaming content, smart looks and user-friendly interface. Ideal for anyone on a tight budget. Samsung isn't being very innovative with its TV range this year, and the NU7400 is virtually identical to last year's MU6400 model. 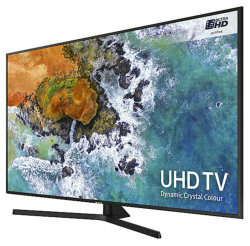 But don't worry - this is a fantastic entry-level TV, and Samsung has squeezed the price down to previously unseen levels for a TV of this quality. The design of the TV is clean and stylish, with a simple Y-stand and charcoal black finishing. Round the back, cables are swept neatly out of view by running them through the stand. Your TV keeps its minimalistic looks, while banishing cable chaos. The One Remote Control lets you control all your Samsung audiovisual devices with a single controller. 50 inches is a super popular size right now, offering the benefit of a big screen while keeping the budget under control. The NU7400 offers the latest features, including UHD (4K) HDR 10+. 4K resolution is the highest you'll find on any current TV and to take advantage of it you'll want to use Netflix or Amazon streaming with a fast internet connection. You can also use UHD Bluray or upscale from a HD source such as Freeview. Using Netflix or Amazon will also enable you to make use of the TV's HDR feature for high dynamic range. This gives you richer colours and better contrast than a conventional TV. The NU7400 is a typical Samsung TV in terms of image quality, giving very dark blacks and bright, vivid highlights. There are some compromises though. The TV uses 8-bit colour, rather than the richer 10-bit palette you'll find on higher-end screens. Viewing angles are limited too, so the brightness and contrast are noticeably better when viewed head-on. But when you consider the price of this TV, we'd argue that it delivers one of the best experiences you can get for under £800. The NU7400 uses stereo downfiring speakers, with a total power output of 20W. This is typical of entry-level and mid-range TVs, and many people will be happy with the result. if you want to improve on the audio quality, we'd recommend purchasing a soundbar. 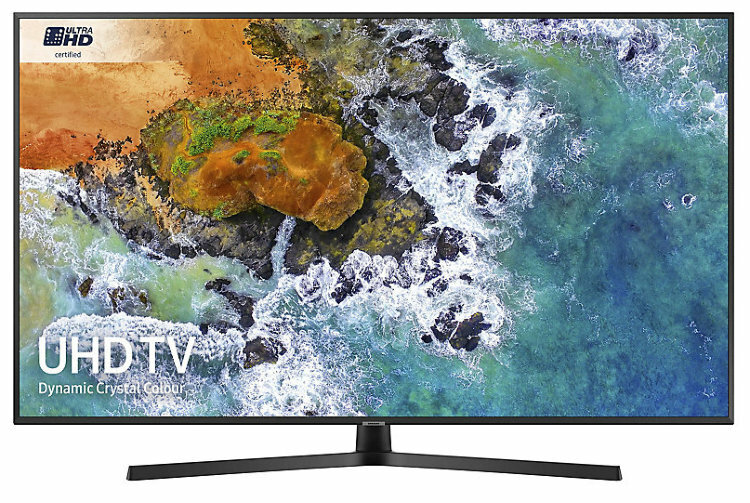 Samsung's Tizen-based Smart Hub is a user-friendly Smart TV system that provides apps for streaming and accessing other content, as well as controlling the TV and connected devices. It's easy to connect your phone to the TV too. All essential connectivity options are covered, including HDMI, ARC, Wi-Fi and ethernet. Screen mirroring from smartphones and tablets is supported, and wireless Bluetooth connectivity is available for a range of devices. The TV market is changing rapidly, but the Samsung NU7400 supports the latest standards, making it future-proof and a safe buy. The most outstanding feature of this TV is its super-low price. Even at launch it's a bargain, and by the time of the Black Friday sales, it might be even lower. With a user-friendly interface and a smart design, you won't go wrong with this model. I have a samSung UE50NU7400 4K tv how can i get bluetooth to work? Does it have voice activation? Can it be wall mounted? Does it have Bluetooth and free view? It has Freeview and Bluetooth. Is the frame/bezel metal or plastic? I have just upgraded from a Samsung 40 inch led smart to a Samsung 50 uhd 4K I have to say what a great tv everything I need plus more,lovely clear picture connect to internet straight away and sky device very good smart remote control, turn on tv and sky + box and Samsung sound bar all start up together. Picture quality is very good when viewed from directly in front of the TV. The downside is when you view from a slight angle to it the picture quality turns milky/pasty. It happens particularly with light colours and affects faces very much so. Strong to deep colours don't seem to be affected as much.